Hi friends! I hope you’ve all been having a fantabulous week.It’s been pretty nice here in the Sass and I’ve had the last couple days off, which means I’ve been slowly moving into my new place, picking up some new spring tops, and spending time with friends. One of my close friends has agreed to build me a set of beautiful bookcases for my new place and we spent yesterday afternoon planning the size, trim, and colour and let me tell you it is going to be a beaut! Stay tuned for pics. Now, lets get to the topic of today’s post shall we? As promised last week (read it here) today I’m going to go into part two of digestion and explain some herbs that are beneficial for healing the digestive tract framed by my experience with the Wholy Tea 30 Day Total Body Detox (or Teatox as I’ve taken to calling it). So without further ado, lets dig in! Wholy Tea was something that had always caught my eye at the health food store, but it’s a little pricy, so when they were offering a buy two get one free deal at the Saskatoon Wellness expo, my friend Heather and I ended up going halvsies and I got a month and a half supply to experiment with. Anyhoo, I’m almost 3 weeks into my Teatox and so far my results have been pretty stellar. Within two days (and I know this because I’ve been keeping a Teatox diary) I was regular as can be. There was some initial gassiness, but so far I’m pretty impressed. We’ll see what happens at the end of the 30 days. This tea is a blend of milk thistle, blessed thistle, persimmon leaves, malva leaves, marshmallow leaves, green and white tea and is supposed to be a whole body detox. If you’ve read this post you already know that I have somewhat of an addiction to teas of all kinds, especially ones that make wild health claims on the packaging. This tea promises to be a total body detox that cleanses the liver and the colon, helps reduce bloating, relieve constipation and indigestion, and stimulate weight loss via these other steps. Now I don’t own a scale because I think they’re the devil and can lead to very unhealthy relationships with one’s body, but I can definitely track my progress in the other areas. Lets take a look at some of the properties of the herbs and why they seem to be doing such a stellar job ensuring each and every one of my days starts with a splash. This herbal bad boy is often used to support the liver and has been shown in various scientific studies to help protect our sweet sweet detoxifying organ from the effects of toxins, such as those found in OTC painkillers like Tylenol. 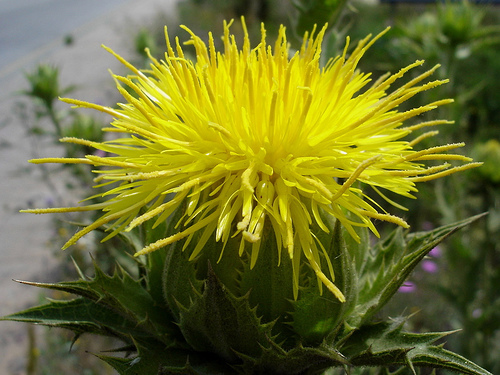 The active ingredient in this herb is a flavonoid called silymarin. 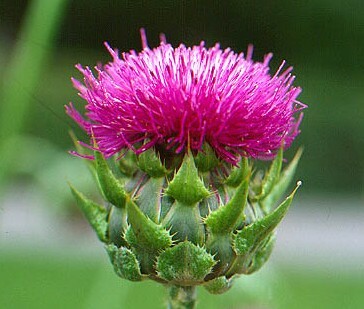 Milk thistle also promotes bile flow, a substance created by the liver and concentrated in the gallbladder and which we all need to digest delicious, delicious fats. The liver also cleanses the body by adding toxins to bile. Therefore, increasing its secretion will increase detoxification, so long as our poops are flowing regularly. Marshmallow contains a lot of mucilage (think gooey and slightly gelatinous) and so it acts as a demulcent, especially in the digestive tract. Demulcents are herbs that have a soothing action and that protect irritated or inflamed internal tissue. 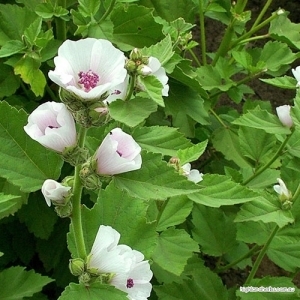 If you have a lot of tummy troubles such as diarrhea, gas, bloating, or constipation, it is very likely your poor little insides are irritated or inflamed so something like marshmallow root/leaf would be helpful in calming said irritation. The roots are more specialized towards the digestive tract and skin while the leaves are used more often to support the lungs and urinary system. All of these organ systems are powerhouse detoxifiers, so anything that supports and protects them will have an overall beneficial effect in the body and help you poop, pee, and exhale nasty toxins from your beautiful bodies. This guy has some bitter properties that help stimulate the production of bile, which we learned above is super important for detoxification. Interesting tidbit: back as we were evolving, our bodies learned that poisonous foods were often quite bitter tasting. For protection, we developed a mechanism that stimulates extra gastric and digestive secretions to better destroy the evil poisons trying to get past our defenses. Herbalists noted this reaction to bitter foods and developed items called digestive bitters, which are combinations of herbs with various bitter properties that are used to stimulate digestion in people who may not be producing enough of their sweet, sweet juices to break down and absorb all the yummy nutrients they’re eating. If you find yourself having a hard time digesting protein-rich meals you may want to try picking up a bottle of digestive bitters (Swedish Bitters are a pretty popular and effective kind) and placing a few drops on your tongue right before eating to see if that helps. Warning: it will taste bitter, but only for a few seconds before you start eating. 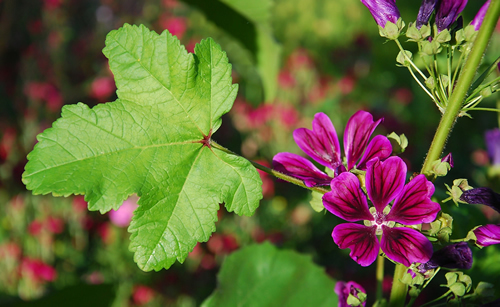 Malva/Mallow Leaf: This herb has similar properties to marshmallow in terms of its demulcent effect on the body and digestive system. It is also an expectorant, which means it helps the lungs expel excess mucuous and ickiness. As someone who smoked for just over ten years, any herb that supports lung detoxification and rejuvenation is A+ in my books! It’s also great for soothing inflammation of the respiratory system associated with dry coughs, sore throats, hoarseness, lung catarrh, bronchitis, asthma, and emphysema. Persimmon Leaves: To be honest I had never really heard about any health benefits associated with persimmon leaves and so had to take my interest to the mighty oracle to find out why it was included in my Teatox. Well, let me tell you that this little baby has some pretty impressive effects in the body. It functions as an antioxidant and according to this study done on diabetic mice it can help improve markers of type 2 diabetes. It goes into a lot of anatomical jargon which is incredibly interesting, but not really the most fun thing to read on a whimsical blog, so I’ll sum up for you as clearly as possible. 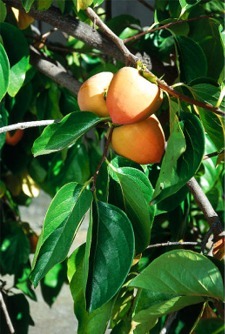 Persimmon leaf appears to affect the liver and the way it processes glucose/sugar and triglycerides. After five weeks supplementing persimmon leaf on top of a normal diet symptoms of fatty liver were improved, LDL and triglycerides in the blood were lowered (this effect is a good thing as high levels of both, though especially TGs, are linked with inflammation and increased risk of heart disease, blech! ), and many enzymes involved in the metabolism of lipids and glucose were positively affected. The long and short of it is persimmon leaf seems to help support the liver as it undertakes several of its myriad important functions. A healthy, supported liver is a major player in the ability to detoxify the body and ensure we continue pooping like champs and so persimmon leaf gets another A+ from me due to its impressive showing in the above study. Well folks, that’s all I’ve got for today. Next up I’ll be posting a couple of recipes for your eating pleasure. I have been experimenting with creating a rice pudding substitute as I don’t really eat rice and dairy gives me instant acne and chest congestion, but the warm milky cinnamon gooeyness is just too good to resist! I played around with a quinoa and coconut milk recipe the other day and it was pretty good, but I think I had a little too much milk. I enjoyed it but I also love weirdly textureless food. I think it’s because my darling mother pureed everything I ate until I was 3 years old. God love her. Anyhoo, stay tuned for more tummy yummies! Have a wonderfully whimsical weekend!